On its last week of celebrating Kulinarya Festival, Bayview Park Hotel prepared delectable cuisines from all regions of our country. 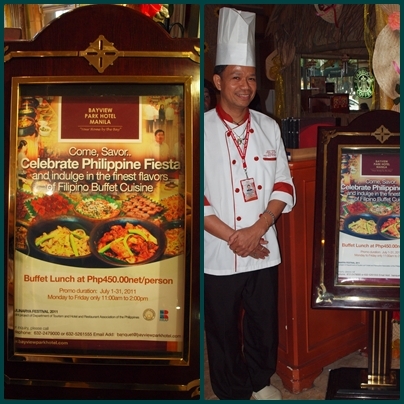 It was been a month of delicious food that hotel has feature for a buffet lunch like Bicol, Iloilo, Mindanao and this week, all foods from different regions will be catered for you. Filipino cuisine is one of the world's tasteful set of foods, influence by different countries which is mastered by the Filipinos through decades and was passed to generations and generations. Like any other country in Asia, Philippines put various herbs and spices on their foods until flavor made out only of its own. Bistek Tagalog - the usual bistek that i have tasted is beef but this one is pork and its more delicious for me. Chief said that cooking pork for a bistek dish saves a little time than beef and the sauce that it produces is more delicoius than the usual, no doubt why I like it. Just small tip for everyone, marinate the pork about an hour with soy sauce and calamansi (lemon) for the pork to be more tender. Then fry it perfectly and pour the sauce you used to marinate then topped it with stir fry onions. Igado - I believe that Igado is an Ilocano dish, because I have a friend in college that loves to cooked it and they are Ilocanos. Pork meat that is used and they also put some liver pork on it that added a distinct taste on it. It is cooked a little saltier, with vinegar and nearly dry for the reason that it has to have a longer shelf life. Pinakbet - We grow up loving vegetable and until now I learned to eat almost every veggies I've known. Cooking Pinakbet would basically boiled all the vegetables and shimmer it instantly to maintain the crunchiness and freshness of veggies. The more crunchier the vegetables the better. Sinigang na Panga ng Isda - this soured fish in slow fire to avoid the fish to crash. The head part of the fish consist of all the taste itself, no wonder why it produces the most delicious soup I've had. It deserves a second round, that's why I gave it another try hehe..
Pancit Hubhub - this pancit originally came from Region 4, specifically in Qeuzon. The noodles was homemade and sauteed perfectly with other healthy vegetables. I will personally recommended it to you and I am sure you will love it. Kinilaw na Tanigue - tanigue is a type of fish that can be associated with tuna, its a southern dish which the fish is only cooked with vinegar and served it with fresh onions,ginger and garlic.I never thought that you can cooked precisely with only vinegar, but this dish open my eyes and my appetite to try it over and over again. And I would try to cooked one at home also after.Thanks Chief..
Of course they also have delicacies like Banana chips, Otap, and dried mango all from Visayas Region. You should also try the Palitaw, Kutsinta, Pichi-pichi and the Biko all made out of rice perfect to have your lunch a great finale. You can also contact them for reservation and inquiry Bayview Park Hotel Manila 2479000 or 526-15555. 1118 Roxas Boulevard cor. United Nation Avenue, Manila, Philippines. Grabe yung kinilaw nagutom ako bigla!!! How mats buffet nila jan sis? oo sis ako nga din eh sarap talaga nya hehe...450/person ung buffet nila sis nasa unang picture...sulit na sulit ang sasarap ng foods nila hayz! !